On the morning of the Feast of Holy Innocents, December 28, about 15 peace activists gathered outside the gates of Davis-Monthan Air Force Base in Tucson, Arizona to commemorate and grieve the contemporary slaughter of innocents. 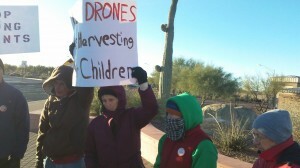 The group held signs calling for an end to drone warfare. An Arizona Air National Guard unit based at Davis-Monthan since 2007 operates armed Predator drones used by U.S. military in Afghanistan and elsewhere. 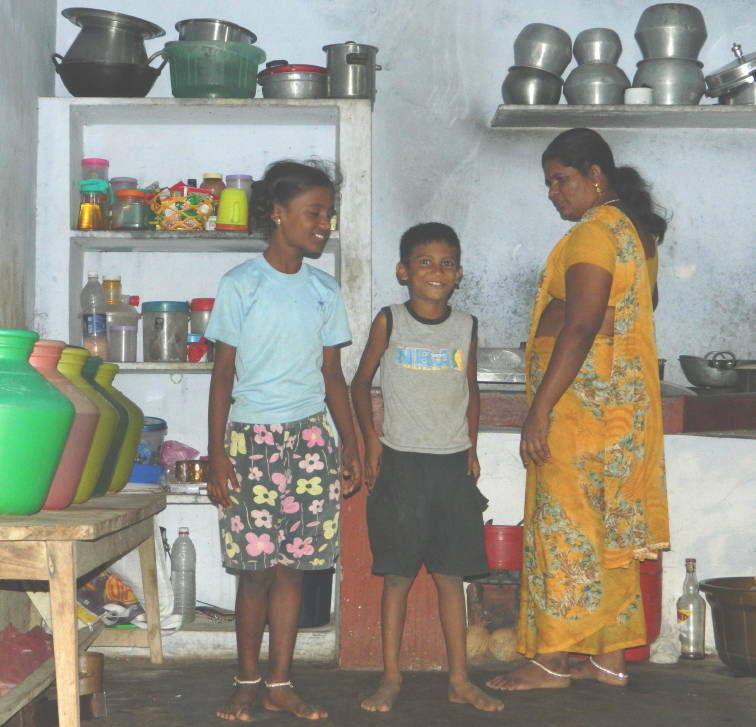 Sundari and her children at home in Idinthakarai. Photo by Veena M.
Three women from the village of Idinthakarai in Tamil Nadu, all leaders in the mass movement opposed to the start-up of the joint Russian-Indian nuclear power project at the southern tip of India, have been released on bail. 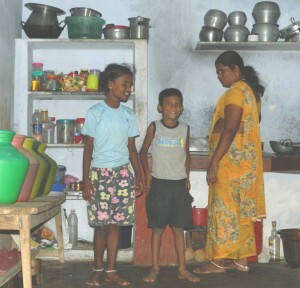 Xavieramma, Sundari and Selvi had been denied bail and charged with various crimes including sedition following their arrests on September 10. They are now ordered to report regularly to a police station in Madurai, over 200 kilometers away from their homes and families. Before returning to Madurai, they were able to spend a few days in Idinthakarai. This photo and the following report were originally posted at countercurrents.org. I am the 7 year old from Idinthakarai village near the sea. Today morning I woke up with a smile.You may wonder what is so special about a boy smiling in the morning. Yes, there is something really special as I have woken up with a heavy heart every single day since September 10,2012. More than 90 days of constant anxiety because my mother was taken away and jailed. For having gathered with the whole village and other villages to say NO to the toxic Koodankulam Nuclear Power Plant. I just cannot understand what is wrong with what we did. 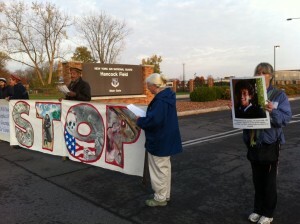 Information from Civic Activity – an organization supporting citizens opposing spread of radiation. On December 9, 2012, Masaki Shimoji, an associate professor of economics at Hannan University was arrested and jailed by the Osaka Prefectural Police. This arrest is extremely unjust in form and content. It is clearly a crackdown on citizens’ movement. Professor Shimoji and others are opposing the “area-wide management of the disaster debris” measure, which intended to spread, incinerate and bury harmful substances in the disaster debris all over Japan that should not be incinerated, such as radioactive material and asbestos. Osaka-city is trying to begin regular incineration and burial beginning in February 2013. Below is the timeline for the arrest. A letter from Prof. Shimoji follows this information. Please sign this petition to demand the immediate and unconditional release of Associate Professor Masaki Shimoji. 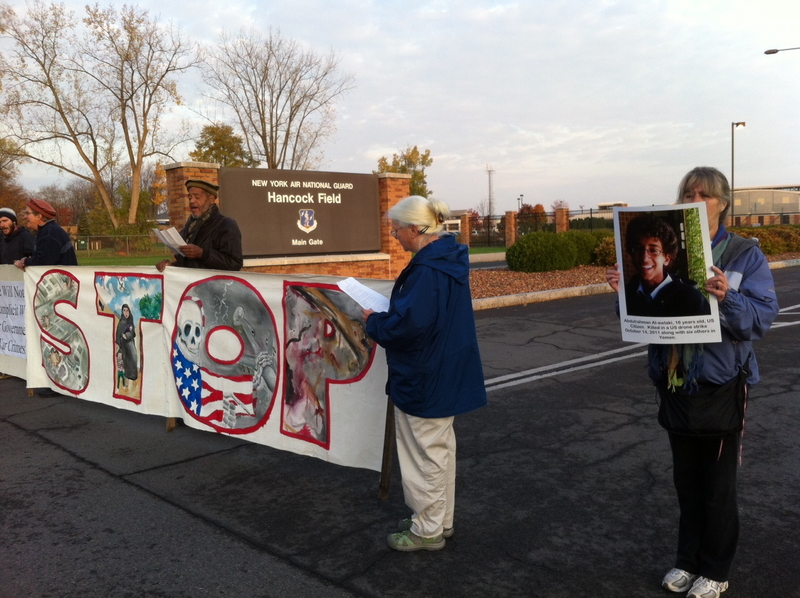 In DeWitt, New York, Town Court, in a swift four and a half hour trial on December 13, Judge Jokl found eleven of the original fifteen protesters of Reaper drones, guilty of trespass. Hancock Air National Guard Base is home of the MQ-9 Reaper drone maintenance and training center, adjacent to Syracuse Airport where soldiers pilot drones used in the extra judicial killings in Afghanistan. Judge Jokl did not allow the war crimes indictment into evidence, thus limiting his scope of interpretation to NY State law. Within ten minutes of deliberation the judge found the eleven guilty. The judge sentenced Ed Kinane and Rae Kramer, of Syracuse, Clare and Ellen Grady, and James Ricks of Ithaca, to 15 days in jail. Ed Kinane and James Ricks started their 15 day sentence in Onondaga County Jail immediately. The other three report to jail at 5 pm on January 11th, 2012. Count I – Damage to national security defense materials, with a fine and or imprisonment up to 20 years under 18 USC 2155. The prosecution has also added 18 USC 2152 which is harm to, among other things, torpedoes from submarines. That claim carries an additional imprisonment of up to 5 years. Count II – Damage to a structure within Y-12, carrying up to 5 or 10 years in prison. Count III – Damage in excess of $1000 – up to 10 years in prison.